Barbara Taylor Laino is a Certified Organic Farmer, Holistic Health Coach, Natural Chef, and Herbalist. Her farm, Midsummer Farm, in Warwick, NY, offers a high-end CSA program, Animal Welfare Approved pastured eggs, and huge heirloom seedling sales each Spring. 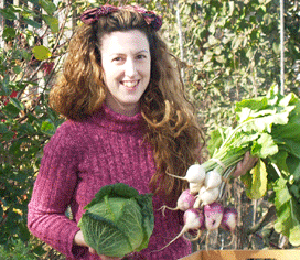 She also writes a monthly Artisanal Living eNewsletter, and runs a workshop series – in the farm kitchen or in the greenhouse in the cool weather – on a variety of artisanal cooking, healthy living, organic and biodynamic gardening, and herbology topics. Her workshop/events schedule and sign up for her eNewsletter can be found at www.midsummerfarm.com along with great information on Artisanal Living.